A cat muzzle may seem like a very strange item to purchase for your feline friend, but it’s a product that can really come in handy in the right type of situation – if used correctly. A cat muzzle is often used for cats who have behavioral issues with biting or for overly aggressive cats. It’s mostly veterinary professionals that use a cat muzzle but they they are available to purchase for cat owners who need them for grooming/other issues too. There are many different types of products available and it can be difficult to know what the best cat muzzle is and what type of features you should look for. In this article we will look at the best cat muzzles and explain why we feel it deserved a place on our list. You will also find a buying guide which will explain what to look for when purchasing a cat muzzle and talk about the benefits of using one. 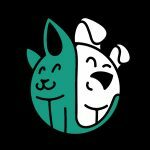 We will also look at how to safely put on a cat muzzle without getting bitten or scratched and answer your most popular questions. 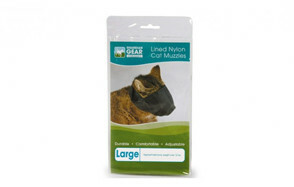 This strong nylon cat muzzle is available in a variety of different sizes dependant on your cat’s weight. The small muzzle is suitable for cats under 6lbs, the medium cat muzzle for cats between 6-12lbs and the large is suitable for cats over 12lbs. The Downtown Pet Supply Cat Muzzle is easy to use and features a fully adjustable velcro strap. It’s made from tough fabric and perfect to prevent cats from biting or chewing. The only downside we could see with this product was that the cat isn’t able to see through the fabric. However, this can be a positive or a negative feature depending on the situation and in some situations it can even calm your cat. If you’re looking for a cat muzzle for biting, this makes a good choice as it’s easy for the owners to attach but difficult for the cat to remove. It’s good value for money too at under $7. This durable cat muzzle has been made from strong nylon, so will sit comfortably on the cat’s face whilst preventing it from scratching or biting. The mask features a small hole which sits near the cat’s nose, enabling them to breathe easily. What we really liked about this particular cat muzzle was that although it was made from strong and durable nylon, it was also breathable. Your cat will not only be able to see their surroundings when they have the muzzle on their face, but the natural mesh design will add more comfort for your cat too. The strong cat muzzle for grooming is available in a variety of different sizes and two different colours. This is the perfect solution for cats who become aggressive when taking them to the vets. This nylon cat muzzle was one of the sturdiest we saw on the market and what made it really stand out was how easy it was to attach to a cat’s head. This is a well made product that is suitable for cats of all sizes (it’s available in small, medium and large) but it’s always better to buy a slightly larger size to allow for breathing space. This cat muzzle is ideal for taking your cat to the vet, preventing them from biting and chewing and cutting their claws. 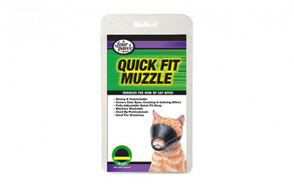 We rated the Quick Fit Cat Muzzle highly as it was the easiest to attach by far. With minimal straps and a really simple design, this is the best cat muzzle of its kind. 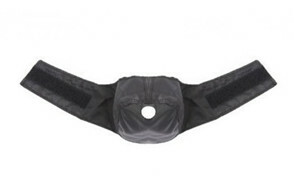 The simple design has been made from a really strong nylon and is comfortable for the cat to wear. What we also liked was that the cat’s nose was completely uncovered, giving them plenty of air to breathe. By covering the cat’s eyes, the product gives a calming effect which is ideal for stressful situations for your feline friend. This brand is used by professionals and we think it provides good value for money for such a high-quality and well designed product. This full face cat muzzle has been manufactured from tough nylon and has been designed for use with cats displaying behavioral problems, such as biting and chewing. This muzzle is suitable for cats who weigh between 6-12lbs so it’s essential you weigh your cat before you purchase in order to get the correct size. This cat muzzle features a simply velcro fastening which enables you to easily and comfortably attach the muzzle to your cat’s head. If you’re looking for a product which provides the best value for money then this 12 pack of grooming muzzles is perfect. The set contains x 9 dog muzzles in the following sizes: size 0, size 1, size 2, size 3, size 4 , size 5, size 3 xl, size 4 xl and size 5 xl) and 3 cat muzzles (small, medium and large). The simple design is comfortable for both cats and dogs and easy to use with a velcro strap. Before making a purchase take a look at this buying guide which will tell you the type of features to look for when buying a cat muzzle, we’ll talk about the benefits of using a cat muzzle and will explain how you can safely use a cat muzzle. One of the most important factors when purchasing a cat muzzle - size is everything. If you buy a muzzle that is too tight then your cat is going to feel very uncomfortable and it could even be dangerous for the animal, buy a cat muzzle that is too large and it probably won’t fit. Most cat muzzle sizes are determined by the weight of your cat, so please make sure that you weigh your cat before you choose the correct size. Other cat muzzles are measured by the size of their neck so you may need a tape measure on hand too. When buying a cat muzzle it’s important to purchase a well made product which is strong, washable and comfortable. Nylon is the most popular choice of fabric for cat muzzles as it’s super durable and sits comfortably across the cat’s face. Putting a cat muzzle onto a cat’s face isn’t as easy as it might look. Veterinary professionals are used to using products such as this and so for them it’s a doddle. For everyday folk it’s a different matter and so you’ll want to choose a cat muzzle that has nice easy to use straps, preferably made from velcro. Are you looking for a cat muzzle that will entirely cover their face and eyes or just stop them from biting? If your reasons for buying the muzzle is to reduce chewing and biting around the house then a more open ‘mesh’ cat muzzle might be the better option. If you’re looking for a muzzle to reduce the stress and violent behavior whilst at the veterinary clinic then a full face muzzle might be the best option. Never keep a muzzle on an animal for too long. You will need to keep in mind a number of different factors when it comes to looking at the comfort aspect of the cat muzzle. At the end of the day, your cat isn’t going to like wearing a muzzle but if you choose nice soft fabric then it’s going to make it more comfortable for your cat. Also bear in mind that you’ll need to buy the right size and take a look at the size of the nose hole too as this will obviously add extra comfort for your cat. There are many benefits to using a cat muzzle. They’re not just used by veterinary professionals, many cat owners have a cat muzzle in their homes too. 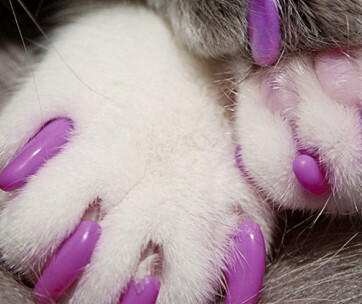 There are a few chilled cats out there that don’t mind it when you trim their nails and brush their fur. 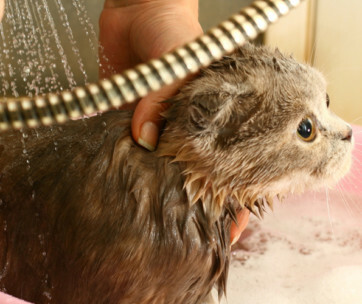 On the opposite end of the scale, however, are the cats that absolutely hate being handled and can become quite a aggressive. 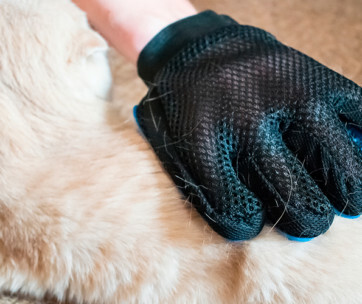 Cat muzzles are perfect for those times when you need to trim your cat’s claws. Or when you are taking them to be groomed by a professional. If your cat has just had an operation or is over-grooming themselves to the point that it has become problematic, then a muzzle could be used. 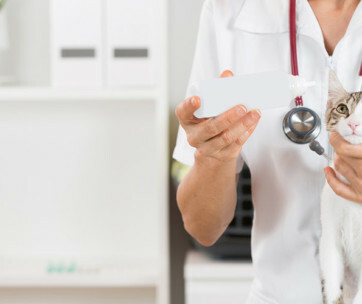 If you are planning a trip to the veterinary clinic and you know that this is something that usually causes your cat distress, then a cat muzzle can really come in handy. If your cat can act aggressively when it’s frightened then the use of a muzzle for a few minutes could save yours and the vet’s fingers from being scratched and bitten! If you work with cats or own a cat that is displaying unfavorable behavior that is of concern, then you might need to use a cat muzzle as an emergency measure. Cat muzzles are only intended for use for a few minutes and should never be used for long periods of time. Please consult a professional before using a muzzle on your pet. Cat muzzles should only ever be used for short period of time, up to twenty minutes ideally. Not all cats will need a muzzle, but if you own a cat who is prone to biting or can become distressed at the veterinary clinic or grooming parlour then a cat muzzle can be helpful. In order to safely use a cat muzzle you will have to ensure that the muzzle that you purchase is the right size for your cat. 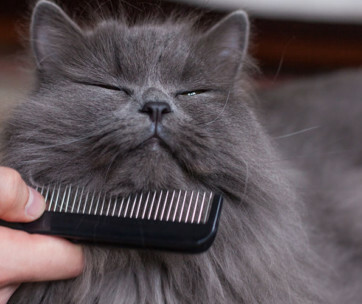 Purchasing the wrong size could not only become uncomfortable for your cat but it might prevent the cat muzzle from working properly as your cat may be able to bite through. If the cat muzzle is too small on the other hand, this can actually be dangerous for your cat as they may encounter breathing problems. So please make sure that you measure or weigh your cat before you make a purchase. To attach a cat muzzle to an angry cat you may need a thick towel. This can be used to wrap the cat gently into a type of ‘burrito’ in order for you to attach the cat muzzle around their head. 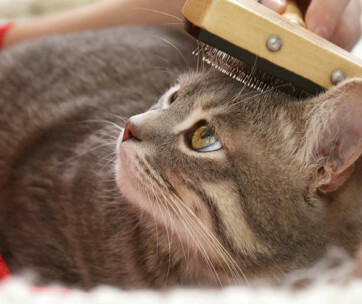 If you are trying to get your cat used to wearing a cat muzzle for regular grooming sessions or visits to the veterinary clinic, then you might want to invest in a calming pet spray. You can spritz a little on the inside of the cat muzzle before attaching it to your cat’s head for 30 seconds before giving them a tasty treat like fresh tuna! If you do this regularly - say once a day - they will eventually associate the muzzle with treats and remain calm when you are attaching the muzzle to their head. Monitor your cat at all times when they are wearing a cat muzzle. Often they won’t be able to see anything so if they run off then this could be very dangerous. They could also bang into objects if their sight is blocked. If your cat seems distressed or they are breathing shallow, then immediately remove the cat muzzle. Pay particular care with breeds such as persians who have shorter noses. Also, if your cat is overheating then you must remove the cat muzzle immediately. A: A cat muzzle is a fabric face mask used for cats that is normally made from a tough material such as nylon. Similar to dog muzzles, these masks are attached around the head with velcro and prevent cats from biting. Cat muzzles are normally used in veterinary clinics where cats can become aggressive and violent when feeling scared and anxious. A cat muzzle allows the cat to breathe through a small hole in the centre of the mask but prevents the cat’s mouth from opening. This is one of the many reasons that cat muzzles should only ever be worn for short periods of time. Cat muzzles can partially or completely cover the face. It can actually be more calming for a cat when they cannot see their surroundings and it can also help by limiting their vision so they do not know where to attack. Q: Can I Use Cat Muzzle On My Kitten? A: It really shouldn’t be necessary, but largely depends on the size of the cat. If your kitten is young, then a cat muzzle shouldn’t be needed as their claws and teeth aren’t as developed as adult cats. Cat muzzles are generally made for small, medium and large sized cats and therefore most muzzles would be too large for a kitten and likely to be ineffective. Unless you are dealing with a large feral kitten then avoid using a cat muzzle on young cats. Our favorite cat muzzle from the list was the Downtown Pet Supply Cat Muzzle which was available in a variety of different sizes. It’s simple to use and made from string nylon with a fully adjustable velcro fastening to make it comfortable and secure for your cat. Perfect for the prevention of biting or chewing, this cat muzzle will cover your cat’s face entirely which has been found to calm most cats.